Welcome to the last hope for #NeverTrump. We sure as hell aren't with Donald so we're with her. Not by choice. Against all odds, Donald Trump has been nominated by the Republican Party. Our nightmare has begun. The only chance now to stop him is to VOTE AGAINST him on election day, November 8th, 2016, or we will be hailing a President Trump. The clock is ticking. 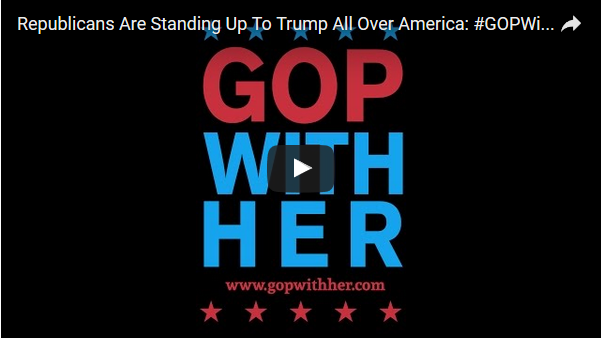 Join us as we traverse the Seven Stages of Grief on our way to acceptance of the fact that we will have to not only vote for, but actively support, Hillary Rodham Clinton. Now that it is official, this page will continue as a blog and support group for our fellow #NeverTrump Republicans who are actually serious about what they say. We meant it when we said we would never get behind Trump. With no serious contender left to stand up to this revolting, self-absorbed, second rate carnival barker con man, what are we to do? With him as the "leader" of our Party, we are no longer the party of Lincoln, we are nothing. With Trump at the lead, we have no voice. While Hillary effing Clinton is pretty @#$%ing far from our 1st, 2nd or 1,000th choice we’ve just got to #GoWithHer. 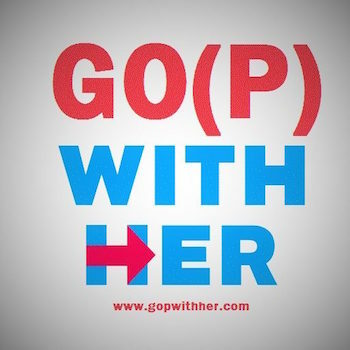 We are… #GO(P)WithHer. Are you? Join the club. I’m A Republican Who Spent My Saturday Getting Out The Vote For Hillary Clinton. This is Why. Hillary/Trump Debate LiveBlog: Round 3! Hillary/Trump Debate LiveBlog: Round 2! Hillary/Trump Debate LiveBlog: Round 1! Does Donald Trump Want to be King? What Will It Take For GOP Leadership To Cut Ties With Trump? #ByeByeBernie #GOPWithHer #ImWithHer #NeverTrump #NotGuilty Anger anti-Semitism Berned Again Bernie Sanders Brexit Broken Promises Clinton Convention Boycott Debates Denial Depression Disbelief Disgust Donald Trump Elizabeth Warren Embrace The Horror First Woman President Gun Control Hillary Clinton Joe Biden Media Coverage Mike Pence Petition Primaries. Republican National Convention Ronald Reagan Special Interests T-Shirts Taxes Terrorism The Horror Trump Trump Trolls Ugh Vice President Volunteering Vomit What's happening to me Worse. Election. Ever. Worst. Election. Ever. Get involved. It will help ease the pain to be amongst others like you.